Wind turbines at the Lee-Dekalb Wind Energy Center. 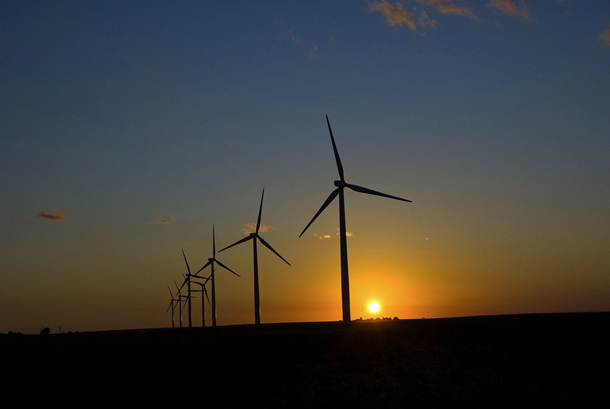 Renewable energy could benefit from a resurgence in the Chicago region's manufacturing sector. Infill redevelopment potential in the Chicago region. Manufacturing is a defining part of the Chicago region’s past, but a report from the Chicago Metropolitan Agency for Planning says it could guide regional development in the future, too. 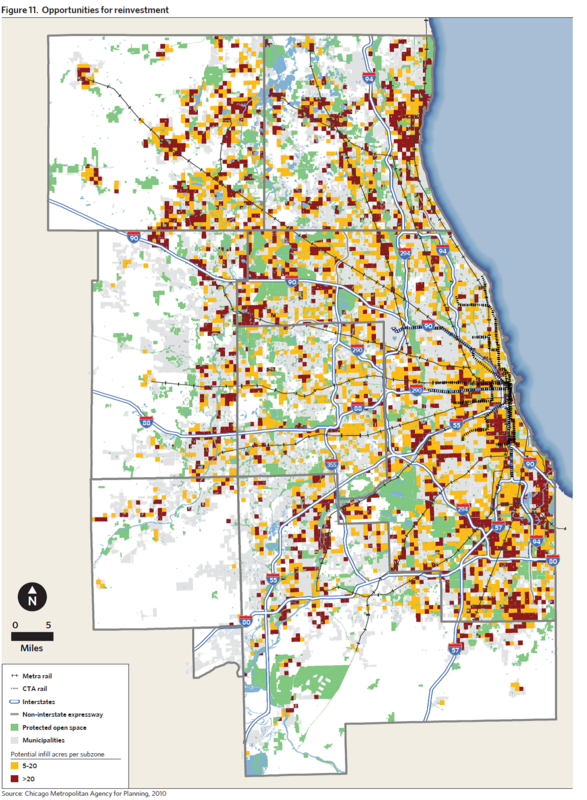 CMAP looked at the seven-county region of northeastern Illinois. That encompasses 580,000 manufacturing jobs, a "cluster" of jobs second only to Los Angeles, but also the region’s suburban and exurban sprawl. The report recommends incentives for infill growth and investment in transportation infrastructure. That would be transit-oriented development, oriented around pockets (or “nodes”) of density near the suburban hotbeds of the region’s manufacturing sector. Transportation infrastructure is already underfunded, with regional transit agencies eyeing about $31 billion for infrastructure improvements and other capital investments over the next 10 years. The job growth projected in CMAP’s report could potentially goad some additional investment, but the transportation system’s looming budget gap is a serious challenge to the kind of transit-friendly development called for in the report calls. To encourage density, the report recommends infill development — redevelopment on existing vacant properties. There are more than 100,000 acres of land available for infill development, CMAP said, but taking advantage of under-used land can be difficult. Industrial land could be environmentally contaminated, and much of the land that once hosted large facilities has been divided up by individual land buyers over the years, fragmenting the land available for new manufacturers. Still, there is massive potential, as seen in the map below. Manufacturing is the largest domestic consumer of energy, making up about one third of total energy use nationwide. Ultimately CMAP’s projections for a revitalized manufacturing base in northeastern Illinois don’t hinge on energy issues; only a few industries account for 70 percent of all the energy use by manufacturers in Illinois, and those same industries account for just 25 percent of manufacturing employment. Nonetheless energy remains a major factor for manufacturing operations. Illinois has a slightly higher cost for energy delivered to industry than other states in the midwest, the report notes. The cost of coal in Illinois is 16 percent lower than the national average, but with natural gas prices plummeting, that is unlikely to be a major advantage. And manufacturers use more natural gas than any other end user. The report also says industrial firms in Illinois could make better use of combined heat and power (CHP) systems that recover waste heat for reuse and electricity generation, citing a World Resources Institute study that found CHP potential in Illinois was the largest in the Midwest, totaling four times the currently installed capacity. They point to an East Chicago steel manufacturer, ArcelorMittal, that recovers more energy from its blast furnace, the world’s largest, than the power from all the existing wind turbines in Illinois and Indiana combined. CHP would be more attractive, the report says, if firms could more easily sell excess energy back to the grid. That practice is currently limited by regulation. The state recently won a grant to improve energy efficiency in manufacturing, which could potentially speed up efforts to install CHP systems. To fund those installations, the report suggests that utilities provide upfront investments to be repaid through future energy savings. Manufacturing growth could encourage renewable energy deployment, too, as manufacturers get a relatively high percentage (5 percent) of their energy from renewable sources compared to the residential (2.3 percent), transportation (1 percent) and commercial (0.8 percent) sectors. And the regional employment outlook could also benefit from an increased demand for renewable energy. Wind turbine manufacturing is growing in northeastern Illinois — German turbine giant Nordex and Chinese company Xianjiang Goldwind located their North American headquarters in Chicago. With only a few hundred regional employees, wind turbine manufacturing is not yet a major employer. It is, however, a rapidly growing market. Energy storage is another likely beneficiary of the kind of manufacturing comeback CMAP recommends. The Department of Energy recently named Argonne National Laboratory a national hub for battery research. But the report also notes that the region&apos;s investments in research and development have plummeted in the last ten years. The authors recommend the state match federal Small Business Innovation Research (SBIR) grants to build on regional expertise. Renewable energy made up 13 of 82 SBIR awards in the region in 2011, more than any other specified research category.